Baseball probably “got into Buddy’s Blood” during one of those 1937 games on the “rock pile,” the name the kids called the baseball field at Mansfeld Junior High School. Later, at Tucson High School (1939-42), he was a member of three State Championship baseball teams (1939-41), and was a captain of the team in 1941. He also played American Legion baseball (1939-41), state champions in 1941; played for the Brooklyn Dodgers farm team (1942, until WWII and the US Marines interrupted); went semi-pro (1946-55), including stints with the Casa Grande Cotton Kings and Tucson Cowboys; was American Legion baseball coach from 1969 until 1981, winning two state titles; and was president of AIA for Baseball and Commissioner of American Legion Baseball (Area A). 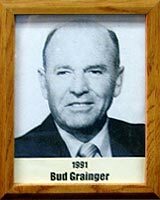 Bud officiated high school and college baseball including the NCAA College World Series in 1975 and 1978 and over thirty NCAA Regional Tournaments. He worked the American Legion Baseball World Series held in Tucson in 1971.